Who really owns the Internet? The Internet, since it has become accessible to most of the world, has been known as an infamous cyberspace of few laws, uncontrolled and unowned by any government. Any effort by the government to restrict Internet privacy has been met by public outcry, asserting that because it is unregulated, it is a sort of sacred space of personal freedom. In contradiction, the Internet can also be viewed as personal property to a certain extent – domain names, like physical addresses, can be bought and sold so that an individual can own a small section of Internet. But how much can an individual control access to their domain? How do we navigate bearing in mind both understandings of this cyber-territory? The World Wide Web was originally created as a space for military communication, and as Lewis and Skawennati have noted, “the ghosts of these designers, builders, and prime users continue to haunt the blank spaces” (2005, p. 108 (course-pack)). It is not a proverbial ‘blank slate’, but a space which is more complex and nuanced, easily influenced by new media and individuals. As we have learned from Angela Haas, Western hypertext – a main function of the Internet, connecting ideas into a “web” which links them together – is a concept historically embodied in wampum. Wampum – a belt-like structure made from clam shells, woven together to create a symbolic pattern or image – “embodies memory, as it extends human memories of inherited knowledges via interconnected, non-linear designs” (Haas 2007, p. 80). 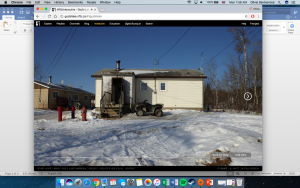 With these foundations in mind, connecting the World Wide Web to both Indigenous and colonial ideas of interconnected memory, what would a term like ‘screen sovereignty’ entail? In this blog post, I will be firstly defining ‘screen sovereignty’ drawing on Kristen Dowell’s work on this topic. I will define this idea as it specifically relates to audience, identity and politics. 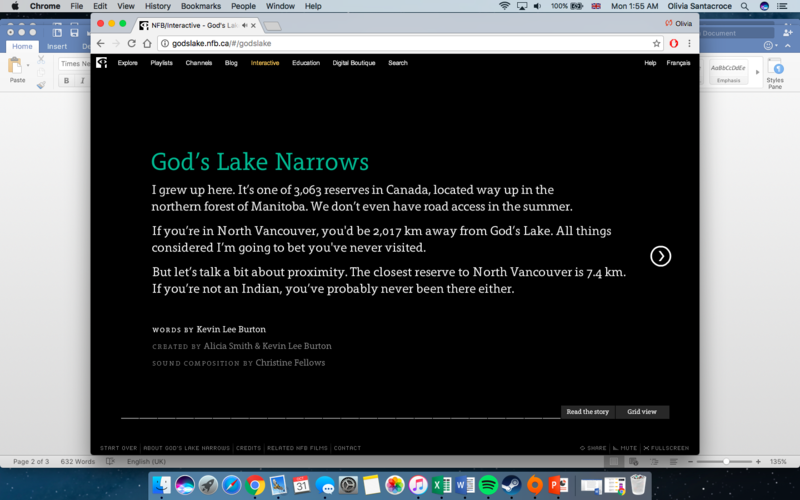 Following this, I will be discussing an interactive website, Kevin Lee Burton’s God’s Lake Narrows , in relation to screen sovereignty and Indigenous self-representations. Throughout this latter discussion, I will be including screenshots of this website to more easily narrate and guide the reader through this process. Overall, in this post I seek to further complicate how we choose to view the Internet, both as a free space and a sovereign space. Screen sovereignty is a term that comes from an idea of ownership, not personal but cultural, within the vast consumption culture of the Internet and other forms of new media. Similar to land sovereignty, from which this term is borrowed, the ruler has absolute control above all. To unpack this concept further, it means having choice in how you represent yourself, who you include inside of the space on what terms, and to some extent, how that representation of yourself is politicized. 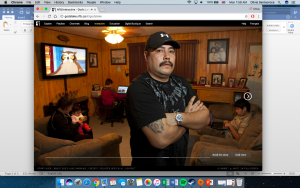 In an Indigenous context, having a claim to one’s own cyberspace and representation is especially important because there are significantly fewer opportunities for Indigenous self-determination as it relates to identity in the mainstream media. In terms of the key audience, Indigenous filmmakers for example “articulate a sense of making films for their Aboriginal communities first and foremost” (Dowell 2013, p. 3). This drastically changes the context in which media is created, and determines how others interact with and understand the piece. To some extent, through the choices made in self-representation and audience, screen sovereignty also has significant power to challenge the dominant (outsider) narrative. Screen sovereignty, by my definition, means the outsider access to Indigenous cyber-territory only by invitation and on Indigenous terms, whatever those may be. God’s Lake Narrows is a piece that embodies certain aspects of screen sovereignty, especially in ways that speak to identity and choice regarding self-representation. 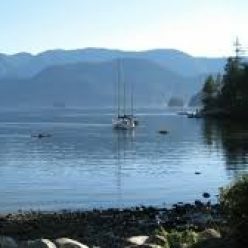 In this close reading, I will be moving through the God’s Lake Narrows web page linearly, specifically analyzing the changes in background sounds, the significance of the pictures used and the message that the content intends to send. Img. 1: First screen upon opening God’s Lake Narrows. First, as I entered the page, it became apparent to me that I was no longer an anonymous user, as I am allowed to be on most sites, but instead a guest. The software of the site allows the site to know your geographical location, so as to tailor each individual’s experience (Img. 1). Such a very simple acknowledgement changes the power dynamic very subtly, but importantly: it challenges a colonial understanding of knowledge as being available for consumption without reciprocation. Being met with this opening, I was suddenly aware of my position as a colonial body, and as an outsider to the community of God’s Lake. 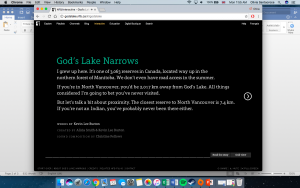 In asserting who is an outsider, the site also asserts who is considered an insider, including people from God’s lake, but more broadly, simply Indigenous peoples. Although particularly impactful for myself, I am left wondering if this interface is designed solely for non-Indigenous peoples or if the opening sequence changes if one were located on reserve land instead. The second feature of the site, which became apparent immediately following the introductory slide, was the soundtrack. Img. 2: Snow covered house, several houses similarly depicted. At first, I was unable to place the sound but as I clicked the “next” arrow (see Img. 2) , it became obvious. Snow crunching and being shovelled. Being from southern Canada, this is an uncommon sound, cementing further my position as outside this community. Even further, it positions the viewer as literally outside the houses. Several slides, interrupted only by the narration slides, show snowy houses from the outside, as if the user is waiting to be invited inside. The houses, as part of the website’s main theme, are also meant to outline how challenging it can be to live on a reserve, especially one with little funding. Img. 3: Slide before the music change. This section ends with the website creator’s understanding of how the reserve has typically been portrayed. The final words are: “It’s time to repaint the picture”, meaning that we are being invited to listen to the community in their self-representation. The soundtrack completely changes after this slide, replacing the snow and outdoor sounds with indoor ones. I recognized the guitar, but it was not until a class discussion that I understood the voice overlay. The voices consist of a woman’s voice speaking quick announcements, interspersed with a man’s voice calling out bingo numbers. The woman’s voice is intended to re-create a closed radio system, a primary form of communication for some northern communities. Though I was being invited to look inside, I was still keenly aware of my outsider status. In summary, I have defined screen sovereignty as a concept that embodies some ways that Indigenous peoples are engaging with new media. Screen sovereignty is being used as a way to better represent Indigenous individuals and their communities. 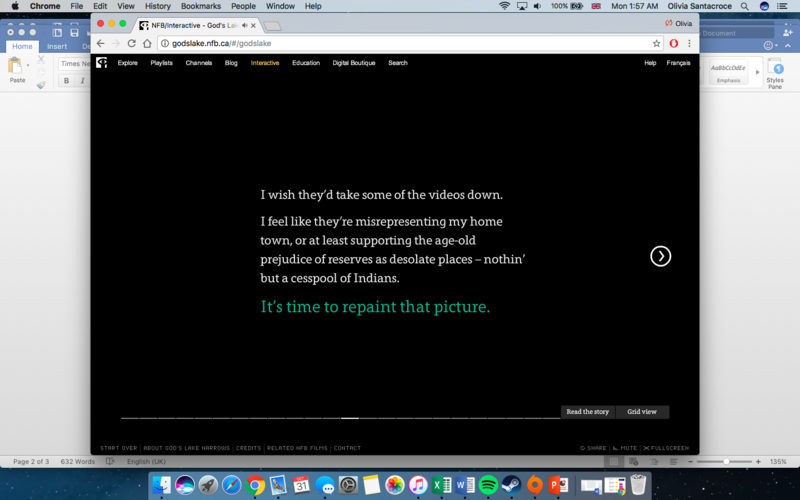 I have applied this concept to the web page God’s Lake Narrows, which is overall an example of screen sovereignty: the community’s story being told on the terms of the community. There were choices throughout through which individuals determined how the community was viewed, the positioning of the user being one of the strongest features. Altogether, this experience as it was mitigated by individual community members, was certainly an act of sovereignty. Dowell, Kristen. “Vancouver’s Aboriginal Media World” in Sovereign Screens: Aboriginal Media on the Canadian West Coast. University of Nebraska Press. Published 2013. pp. 1-20. Print. Haas, Angela M. “Wampum as Hypertext: An American Indian Intellectual Tradition of Multimedia Theory and Practice.” Studies in American Indian Literatures 19.4 (2008): 77-100. Print. Lewis, Jason, and Skawennati T. Gragnito. “aboriginal Territories in Cyberspace.”Cultural Survival Quarterly, vol. 29, no. 2, 2005., pp. 29. Print. “NFB/interactive.” NFB/Interactive. N.p., n.d. Web. 28 Oct. 2016. You are doing some important work here, Olivia–particularly in how you are translating Dowell’s definition of screen sovereignty into cyberspace. More serious consideration about the ways in which these definitions shift as we move them across media is vital to the field. GLN provides a very good point of analysis to flesh these ideas out and give them life and you provide some very detailed, well organized analysis. Nicely done.